Down Bournemouth Express passing Clapham Cutting. Southern Railway “King Arthur” class Locomotive No. E.792, “Sir Hervis de Revel”. The train is running over a section of track fitted for both steam and electric working. IT has been a great puzzle to decide upon the most suitable title for this article. To speak of the fine service of expresses that will form the subject of our study this month merely as “The Bournemouths” - quite apart from the lack of euphony in any such nickname - is to overlook entirely the other important places that they serve, and especially the great and increasingly prosperous port of Southampton. So why not follow the excellent example set by the LMS Company in dubbing their Midland Manchester expresses “The Twenty-fives”, as we saw in a recent article? 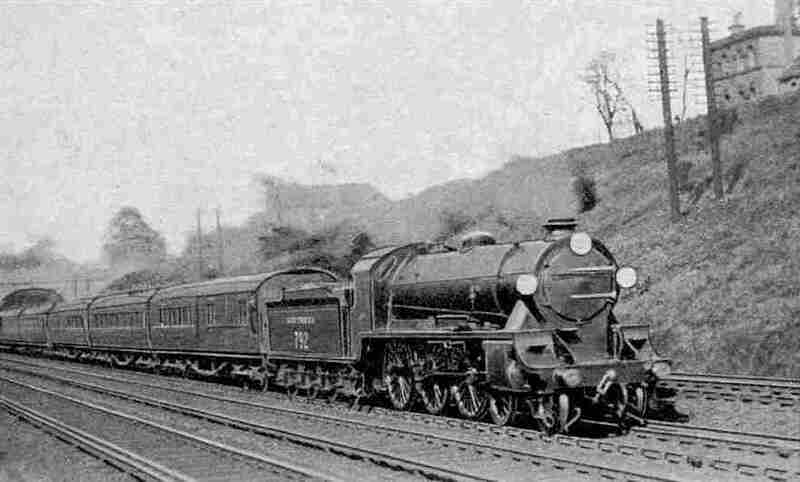 By so doing, and with equal appropriateness, we shall arrive at “The Thirties” as the nickname of the much more extensive series of express trains, all leaving Waterloo, without exception, at thirty minutes past the hour, that connect London with Southampton and Bournemouth. The title is the more fitting in that the Southern was the first British railway to adopt on an extensive scale this valuable principle of systematic departure times from its London terminal stations to all parts of its large system. the most complete. During the summer months the first Bournemouth express leaves at 8.30 in the morning, and the series goes on without a break at each “thirty” round to 7.30 in the evening - 12 expresses in all. Beginning with the 10.30 a.m. down, each of the even hour “Thirties” - the 10.30, 12.30, 2.30, 4.30 and 6.30 - calls only at Southampton West between Waterloo and Bournemouth Central, making the journey to Bournemouth in 2¼ hours. The even hour “Thirties” carry through portions for Weymouth, in addition to the main section of the train, which proceeds on through the Central to the West Station at Bournemouth. During the winter months there is not sufficient traffic to warrant the running of the 10.30 a.m. from Waterloo, and the 2.30 p.m. is run on Mondays, Fridays and Saturdays only. Otherwise the service remains virtually unaltered throughout the year. 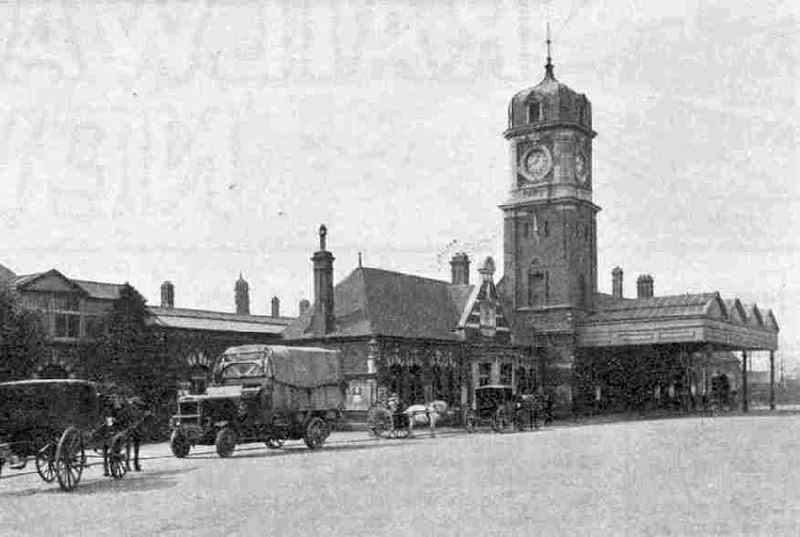 The odd hour “Thirties” make various additional calls, chiefly at Basingstoke, where important connections are made; the Cathedral City of Winchester; and Brockenhurst, the heart of the New Forest and junction for Lymington, whence a steamer service plies to Yarmouth, at the west end of the Isle of Wight. In certain cases further stops are made, such as Surbiton and Woking, at the London end; Christchurch and Boscombe; at the Bournemouth end; and Eastleigh; the journeys by these slower “Thirties” for the most part taking round about 2 hrs. 50 min. to Bournemouth Central. It is typical of the comfort of present-day travel conditions on the enterprising Southern that every one of “The Thirties” carries a restaurant car. In the formation of the trains that travel at hours when there is no great demand for meals, the restaurant accommodation consists of an ordinary compartment coach into one end of which there has been built a kitchen and pantry. From there light refreshments and a la carte meals are served wherever in the train they are desired, portable tables being set up in the compartments as necessary. In the earlier days of Southern restaurant car enterprise the same procedure was followed in the busy trains also, and I well remember, on one occasion in particular, counting no less than 24 compartments in the popular mid-day Bournemouth express, in addition to the restaurant car proper, furnished with tables and laid ready for lunch! Something like 150 lunches must have been served simultaneously on that day between London and Southampton - a nice problem for a restaurant car staff serving up and down the corridors from the exiguous confines of a restaurant car kitchen! To-day, on the busier of “The Thirties”, very fine 58-ft restaurant cars of the latest type are used in pairs. The first-class car, which also contains the kitchen and pantry, seats 24 diners, and is flanked by a third-class open car with seats for 64, so that 88 passengers can be fed in the cars at one sitting. The people of Bournemouth profess to have a grievance in that their best trains from London are not so fast as the best of pre-war days. Before the war the 4.10 p.m. out of Waterloo covered the 108 miles to Bournemouth Central without a stop in the even two hours, and there were two trains making the same run in the reverse direction. The 2 p.m. down also made one stop only - at Christchurch - and required six minutes more on the journey. To-day the best time is 2 hrs. 14 min, except on summer Saturdays, when pressure of traffic makes it necessary to run certain trains in division, and the first part of the 12.30 p.m. runs down non-stop to Bournemouth Central in eight minutes over the two hours. Why, then, this slowing down? The answer is the ever-growing importance of Southampton which, with its maritime connections, bids fair ere long to be, if it has not already become, the most important town on the Southern system outside London. The Southampton traffic demands an hourly train service to and from London with just as much insistence as that to and from Bournemouth, so that it is not reasonable to let the Bournemouth trains pass through Southampton without stopping. But what the Bournemouth people “lose on the swings” they most certainly “gain on the roundabouts”. Apart from their four pre-war two-hour trains, the remainder of the service was slow, irregularly spaced and infrequent. To-day they have their hourly service from London, with trains each two hours averaging 2¼ hours on their journeys, and every train made up of vestibuled coaches and provided with restaurant car accommodation, as we have already seen. Even the two-hour trains of pre-war days were not so equipped, though certain other trains carried restaurant cars. It is singular to recollect, too, that one of the earliest Pullman services in Great Britain - of first-class cars only, one of which was included in certain trains - was run between Waterloo and Bournemouth, though now long since abandoned. To revert to the lengthened journey time between Waterloo and Bournemouth, this is due partly to the time required for the stop at Southampton West, and partly to the much increased weight of the trains. The pre-war two-hour trains weighed from 200 to 250 tons all told; to-day from 350 to 400 tons are common figures on the Bournemouth service. Southern Railway “King Arthur” class Locomotive No. E.787, “Sir Menadeuke” leaving Southampton West Station. This Locomotive was one of the first of the type to be fitted with Smoke Deflectors. We now have to choose one of “The Thirties” for our journey. We cannot do better, I think, than the 12.30 p.m. luncheon car express from Waterloo, as it is easily the most historic train on the service. As far back as 1845 there was a 12.30 p.m. express from Nine Elms - the first terminus of the London and Southampton Railway - and, striking to relate, even in those early days it made the journey to Southampton with two stops in 120 minutes, as compared with the present 92 minutes from Waterloo. Taken all the year round, too, the 12.30 p.m. is the most popular and best-patronised “Thirty” of the day, and is therefore the heaviest and the hardest to work. Further, it has the merit of allowing us to see the whole of the route traversed in daylight, even in mid-winter. Soon after mid-day, therefore, we must find ourselves at Waterloo Station, as neither time, tide nor the Southern Railway is likely to wait for us should we be late. On our journey by the “Atlantic Coast Express” we inspected Waterloo at some length, so that we need not stop now for another detailed survey. It is easily Britain’s finest railway terminus, and this chiefly because it has been carried out as one complete scheme, rather than as a succession of additional platforms tacked on to an original station of small dimensions. The Waterloo of to-day appeals even more to those of us whose memories are long enough to recall the chaotic and labyrinthine collection of buildings that it replaced. Today we move freely across the roomy concourse, planned with its beautiful curve from one side of the station to the other. We admire the singular spaciousness and airiness of the great structure - the roof, by the way, has swallowed up no less than 1,000 tons of glass and 60 miles of metal glazing bars! - and find our train without the slightest difficulty at No. 6 platform. The attractive green livery of the coaches immediately invites attention. Present-day Southern stock, indeed, has a particularly handsome and workmanlike appearance, the steel-plated coach exteriors having little in the way of projections to disturb the even contours of the coach sides. The vehicles are heavy, for the most part weighing 32 or 33 tons apiece, but no aggregation of them - within reasonable limits, of course - appears to occasion the slightest difficulty to the “King Arthur” 4-6-0 engines used exclusively on this service. The trouble to-day appears to be, indeed, that the “King Arthurs” not to mention the later “Lord Nelsons”, can handle without difficulty longer trains than were ever foreseen by those who planned and laid out the 21 platforms of the new Waterloo! At times the 12.30 p.m. may load up to 13 or even 14 coaches, but at this time of the year the load is not likely to exceed 12 - six in the main portion of the train, for Bournemouth West; two for Swanage, and four for Weymouth, making a total tare or empty weight of 380 or 390 tons. With passengers and luggage the gross weight behind the engine tender will be 400 tons, or slightly over. The praises of the “King Arthurs” have been sung in these pages before. It was Mr. R. W. Urie who laid the foundation of the design, first in the series of engines numbered from 482 to 491, and then in the far more successful 736-755 engines, in which the driving wheels grew from 6 ft to 6 ft 7-in. Mr. Maunsell capped the work of his predecessor by introducing modifications of the valve-motion, which enable the “King Arthurs” to be worked with the full regulator and short cut-off methods so popular on the Great Western Railway. It is safe to say that, for efficient and economical working, the Southern “King Arthurs”, as a class, have no superiors for their weight - with the possible exception of the Great Western “Saints” - among British express locomotive types. We cannot help noting by the way, the “wings” with which our steed has been provided, on both sides of the smoke-box. They have no connection with flying however, other than that when the engine is running at speed, they are designed to cause a strong up-draught of air, and so to lift the exhaust steam clear of the front windows of the cab. Out of the platform, as at St. Pancras and Euston, it is the practice for the engine bringing the empty coaches into Waterloo to give a helpful “shove” in the rear, in order that a smart start may be made up the short initial gradient. It is quite likely that between Waterloo and Vauxhall an impertinent electric train that has started after us may overhaul our proud “King Arthur” while he is getting his heavy load into speed, but he will get his own back with interest presently. Not too soon, though, for the Southern “electrics” are easily capable of speeds up to and slightly over 60 miles an hour, and 55 an hour or so is a common rate of electric travel between Vauxhall and Clapham Junction. The tremendous width of electrically-equipped tracks, as we approach Clapham Junction and are joined by the Brighton section lines from Victoria, is a reminder of the enormous progress made by Southern electrification in the past few years. The total of single miles on the Southern system now electrified is no less than 875, and of “route miles”, ranging from ordinary double lines to the vast expanse we see here, the aggregate is now 256 - enough to stretch nearly from London to Newcastle-on-Tyne, and by far the biggest electrified railway system in the world. Down Bournemouth Express passing Barton Mill, drawn by Southern Railway “King Arthur” type 4-6-0 Locomotive No. 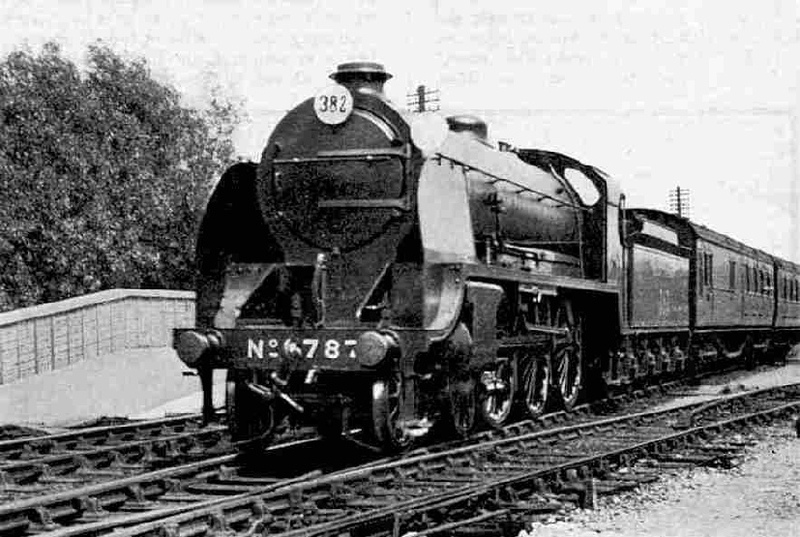 E.791, “Sir Uwaine”. It takes us about seven minutes to clear the four miles through Clapham Junction. With its 17 platforms, this is Britain’s busiest junction, handling a total of 1,730 train movements daily. Our speed has mounted into the “fifties” by now, but it falls slightly as we ascend through Clapham cutting, and then, ere we dash through the line new station at Wimbledon, begins once again to rise. From here on to Surbiton cutting the track is practically level, followed by a gentle fall through Surbiton to Esher, where we reach and probably just cross the “sixty” line for the first time. Speed remains at or slightly above the mile a-minute rate on through Weybridge to the bottom of the dip near Byfleet, adjacent to the Brooklands racing track. Here once again the speed potentialities of our “King Arthur” may be challenged, either by a racing car on the track or an aeroplane above, neither of which, however, is hauling behind it 400 tons of load with several hundreds of passengers. Our maximum speed here is likely to he round about 65 miles an hour. Now our “King Arthur” has some “collar-work” ahead. For the next 30 miles the gradients, though not steep, are almost continuously against the engine. First we have 10½ miles from mile-post 20½ to mile-post 31, steepening gradually from 1 in 368 to 1 in 298; then a level six-mile stretch through Farnborough and Fleet to three miles up at 1 in 337 to Winchfield. Next come six more undulating miles ere we strike the six miles up at 1 in 249, past Basingstoke, which marks the conclusion of the climbing. To maintain a high average speed, therefore, the engine must be worked very hard without respite practically all the way from Waterloo until we have cleared the 52nd mile-post, four miles beyond Basingstoke. We shall probably breast the first long stretch, to mile-post 31, at a minimum rate of 50 miles an hour or thereabouts. Touching 60 and over along the Farnborough “level”, the next slight ascent to Winchfield our “King Arthur” will take in his stride, so to speak; and once again reaching or slightly exceeding 60 beyond Hook, we shall forge up the final 1 in 249, with speed falling gradually to 50 past Basingstoke and Worting Junction, where the West of England main line leaves us on the right, and ultimately to a minimum of between 45 and 48 miles an hour. The 24½ miles to Woking should be cleared in an even half-hour from Waterloo; the 48 miles out to Basingstoke will not take more than 55 minutes or so. “The Thirties” are allowed slightly more in their timings through Basingstoke than the best expresses on the West of England route. The line does not begin to fall immediately after the summit at mile-post 52. We run along level track until we thread a short tunnel just before passing, on the right-hand side of the train, a signal-box called Litchfield. This marks the beginning of a gradient that stretches without a break from the 55¾ to the 76¾ mile-post. For 16½ miles down the gradient is almost perfectly even, averaging just 1 in 250. The engineering of the line here is really rather remarkable. Despite the sharply undulating character of the down land country, the line pursues its even course by means of deep chalk cuttings and tunnels here and there, interspersed with high embankments, across the county of Hampshire in its slantwise direction from north-east to south-west, with scarcely a deviation from the straight line. Any speed within reason might easily be run down so tempting a declivity as this; I have indeed, from the footplate, timed a maximum of 83½ miles an hour past Winchester. If we are on time, however, our driver will probably be content to stick to a maximum not much over 60 miles an hour, but possible reaching 70 or a shade over. 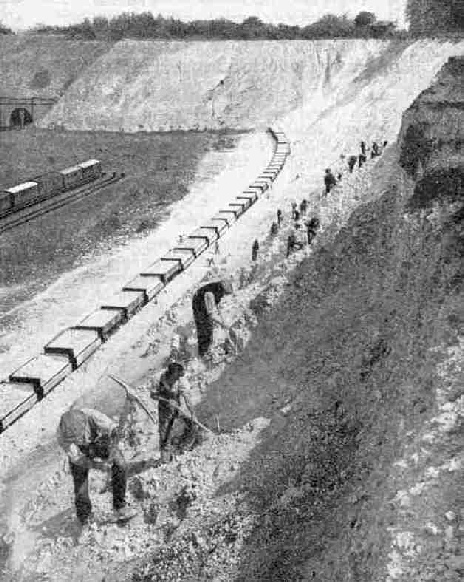 We shall dash through the wide cutting, terminated by tunnels at both ends and used as a chalk quarry by the Southern Railway, in which stands Micheldever station. Possibly we shall note that we have come 10¼ miles through this sparsely-populated country from Basingstoke without passing a single station; in the 18¾ miles from Basingstoke to Winchester, indeed, there is only the one intermediate station, at Micheldever. At Winchester Junction the line that has come from Waterloo by Alton - actually shorter than our main line but considerably more difficult from the traffic point of view - joins us on the left; while at the same time we pass over the single line of the old Didcot, Newbury and Southampton Railway, which is later to join us below Winchester, and has given the Great Western, by absorption, direct access to Southampton. Over this course, by the way, there will run this evening the through Glasgow to Southampton coach that accompanied us last month as far as York when we were coming down from Glasgow to join the LNER North-Country boat express. In 75 or 76 minutes after leaving Waterloo we clear Winchester, and a little under seven minutes later we hurry through Eastleigh, at whose extensive locomotive works of the late London and South Western Railway our “King Arthur” first saw the light. Shortly afterwards we enter the suburbs of Southampton. The main station of the original line - Southampton Terminus - which has recently been rebuilt and modernised, lies dead ahead of us; in the earlier days Bournemouth and Weymouth trains entered it and reversed for the remainder of their journey. A later station was built at Southampton West, and by means of a short spur line known as Northam Curve we diverge from the straight so sharply at Northam Junction as to entail a very severe reduction of speed. Three minutes later we are standing at Southampton West. The timetable allows 92 minutes for this 79½-mile journey in both directions - it seems a pity that the figure cannot be cut to the even hour-and-a-half - and quite likely our “King Arthur” has a minute or so in hand. Here, as there are no water-troughs along the route, our driver, despite the use of a large eight-wheeled tender, will probably draw slowly up to the water column in order to replenish his tank. The public timetable shows an allowance of live minutes for the Southampton stop, but actually the working time is seven minutes, so that we are due away at 2.9 p.m. At first the line runs along the margin of Southampton Water, and if we look back towards that part of the town that stretches as a kind of peninsula into the water, where the docks are located, we may have a striking reminder, not merely of the marine activities of Southampton, but also of the vast size of some of the vessels using the port. There is a church at that end of the town, with a tower of quite a reasonable height. But if there happens to be in the docks any one of that great trio of ocean mammoths the “Majestic”, the “Berengaria” or the “Leviathan” - you will see that church and its tower positively wilting into nothingness by reason of the comparison! Presently we pass Redbridge, where the Southern Railway have now established their chief permanent way depot, for casting chairs, creosoting and chairing sleepers, making switches and crossings, and so on. Then we bear sharply to the left over the River Test, and enter the New Forest country. The line rises gently through Lyndhurst Road and then drops sharply towards Beaulieu Road and Brockenhurst, which we pass at over 60 miles an hour. After that come another sharp ascent to higher ground at Sway, undulating line to New Milton, and a further swinging drop to the valley of the Avon at Christchurch, where a curve through the station demands some reduction of speed. Lastly we rise at 1 in 99 for a short distance, and then at easier grades into Pokesdown, an outlying suburb of Bournemouth; Boscombe; and finally Bournemouth Central. The 28½ miles from Southampton have been covered easily in the 36 minutes allotted. A view of the chalk quarry at Micheldever. The extensive scale of the operations may be realised from the length of the train of wagons. Main line tunnel on extreme left. Bournemouth Central is yet another of the stations on which a good deal of money has been spent recently by the enterprising Southern Railway with a view to modernisation. The chief improvement is an extension to 1,750 ft of the main down platform, so that two trains may be dealt with at the same time. The stay of the principal portion of our train here, however, is brief. A separation is made at the centre, and at 2.48 p.m. The “King Arthur” draws out with the six front coaches for Bournemouth West. As the crow flies the latter station is only just over a mile distant, but the circuitous course of the railway round the outskirts of the town, through Meyrick Park, makes a 3¼-mile journey of it, concluding with an exceedingly steep fall down to the terminal. Meanwhile our rear portion of the train has attached, probably, a Drummond 4-4-0 locomotive for the 35-mile run to Weymouth. We re-start at 2.51 p.m. Various stops have to be made. After negotiating some very sharp curves, and descending, a gradient that is for 11 miles as steep as 1 in 69, we find ourselves skirting Poole Harbour, and presently stop at Poole, 5¾ miles from Central, at 3.2 p.m, leaving at 3.5 p.m. From Bournemouth West also this route is used, as far as Holes Bay Junction, beyond Poole, by the trains of the Somerset and Dorset Joint Railway which is the way by which the Midland Division of the LMS, extending its most southerly tentacle to Bath, obtains direct access to Bournemouth. From Poole we have a short run of seven miles to Wareham, an important Dorset town where connection is made with the popular resort of Swanage, allowed 12 minutes. The next break is one of 15 miles, from Wareham to Dorchester, over which the gradients are chiefly against the engine, rising as steeply in one part as 1 in 100, for 1¾ miles in all, and elsewhere at 1 in 200 and 1 in 240. The uphill time allowance is only 19 minutes, however. At one period the late London and South Western worked over this section the fastest run in their timetable, the 15 miles from Dorchester to Wareham being allowed 16 minutes, start-to-stop. the tunnel above Upwey, and then descend precipitately a gradient of two miles ranging in steepness from 1 in 54 to a short strip at 1 in 48, to Upwey. Then we have a mile at 1 in 71 to 74, and a final mile at 1 in 170 into Weymouth - a nice start for up trains! But it is the Great Western Company, which uses this line from Dorchester into Weymouth, that suffers the worse of the two in this respect, as the Great Western trains, including those of the boat service between Weymouth and the Channel Islands, are usually the heavier. So, at four minutes before four o’clock in afternoon, we alight at Weymouth, singular to reflect, at the conclusion of the journey, that three more of “The Thirties” have already left Waterloo in pursuit of us! The first railway communication between London and Southampton was brought about as the result of the success of the Liverpool and Manchester Railway. The ship-owners of Southampton felt uneasy in regard to the development of Liverpool that was likely to result from the railway, and they determined to have a railway of their own. Money was raised and in 1832 a Bill was introduced into Parliament for the construction of the London and Southampton Railway. The Bill was thrown out on this occasion and also again in the following year, but in 1834 it was successful. Work commenced in due course, but one difficulty after another was encountered and progress was extremely slow. In the meantime, the available money came to an end, Fortunately, there were men at hand capable of handling the situation, and after some changes among the leading engineers, work proceeded steadily. There were still difficulties to be encountered, however, including many cuttings and embankments and also the crossing of Fleet Pond, beyond Farnborough. Gradually the work proceeded, and by June, 1839, it was possible to make the journey from London to Southampton by a combination of train and coach. The trains ran from London to Basingstoke, and then came a coach ride to Winchester, followed by another train trip to Southampton. This state of affairs continued until May of the following year, when the first train ran through from London to Southampton. After this line was opened, the people of Portsmouth decided that they would like a branch from it, but they insisted that the name should be altered to “London and South Western”, to avoid using the name of the rival port! The main entrance of Southampton West station, which deals with a large volume of passenger traffic. The present station was opened on 5th November, 1892, and was built on the site of the old Blechynden station. Since 1892 many additions and alterations have been made. The up platform is 600 ft in length and the down platform 800 ft in length. The entire station is supported on a foundation made of concrete 30 ft deep. The height of the clock tower is 100 ft.
You can read more about “The Atlantic Coast Express”, “The Folkestone Flyer”, “The Golden Arrow”, and “The Story of the Southern” on this website.